Modern sword by bladesmith J Helmes, patterned after historical Viking swords. The Vikings were a group of basically Nomads who came down from Norway and Sweden, pillaged the European coasts, and eventually settled in France, Germany, and the British isles. By the late Romans, they were considered “barbarians”; they did not have fighting formations, did not regulate order as much, and mostly focused on the might of the individual warrior, as opposed to the Roman focus on the entire Legion. According to the Vikings, the better you were in battle, the better you were in society. This is why weaponry, armor, and equipment varied so much in the Viking ranks; you used what you could afford. If you could afford it, the most prized weapon was the sword. Viking sword fighting is not the same you see in movies- slow, twirly-wirly sword fighting with plenty of parrying and cool moves. The Vikings would rather bash you over with the shield, avoiding your sword, and hack you to pieces in about a dozen strokes. This sword fighting, if one-on-one, would normally start with a slow standoff, both warriors examining the enemy and waiting for an opening, then once one of them sees one, bashes in and hacks at the enemy whilst warding off with the shield. Very. Very close quarters. Once you’re that close, it’s either kill or be killed. This is why the Vikings needed a sword that was light enough to deliver blow after blow in quick succession, be heavy enough to actually inflict damage, and yet still be pointed enough to pierce chain mail, the main armor at the time. 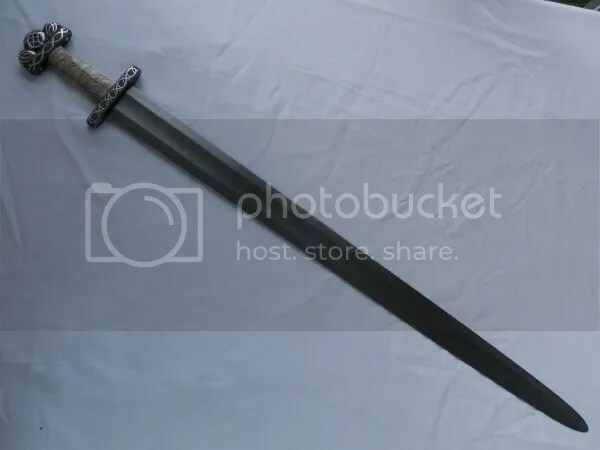 The sword had great religious importance to the Vikings as well; after defeating an enemy, the victor would ceremoniously destroy his opponent’s sword, so that the enemy would not bother him in the afterlife. The sword was literally to them, the soul of the warrior. The smith who made these swords was thought of as a powerful being, to be able to make these swords. This smith was no barbarian. Using superior smelting techniques and a process called making “crucible steel” created a steel that was decades, even hundreds of years ahead of its time, and was borrowed from techniques used by smiths in the near-east. The best of these swords, only about 40 have been found to date, were inlaid with the name “Ulfberht”. The swords that were inscribed with this name have been studied, and shown to be far superior to the swords that were not inlaid as such. This entry was posted in Uncategorized on October 31, 2013 by Captain Belaq. In classical era Greece, the most powerful war machine the Greeks had was the phalanx. Rows upon rows of armored hoplites, each carrying a spear that sometimes reached 30 feet long. If you have difficulty imagining this, imagine a large block, with about forty 30-foot long spears protruding from the front. But imagine if this block of bristles was penetrated, say by a cavalry charge hitting them from the back or flanks. 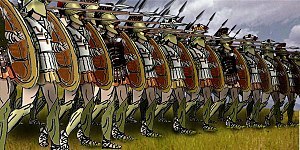 The hoplites cannot turn around and use their spears; they are way too long to be used effectively. The formation has been broken; body mass is no help any more. So what do the hoplites do? Pull out the secondary weapon, the Kopis. 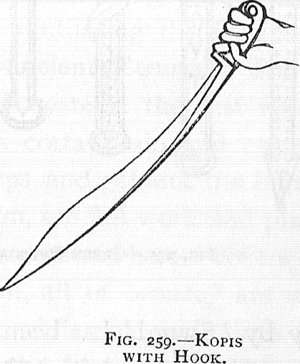 The Kopis is basically a machete, a blade about 2-3 feet long, with a blade that curves inward towards the edge. The climax of the blade width is about 2/3rds of the way towards the point, the optimum impact area. The grip was often made with an overhook at the pommel, and sometimes a chain across the knuckles to keep the sword with the user. This thing was deadly. Figures on ancient pottery often showed the warriors raising the Kopis well behind their heads, for optimum striking force. Even if the Kopis did not succeed in piercing armor, it could almost definitely kill the person wearing it from the concussion alone. Even if it didn’t kill the person, he’d at least walk or run away from that fight with a broken arm and a job for the armorer. Some Kopii were cast from bronze, but once iron became available warriors reverted to that, as iron is much tougher and had less chance of breaking under the incredible force. sword as the Kopis, just was of Iberian, not Greek origin. No one really knows who came up with the design first (I’m personally rooting for the Greeks). 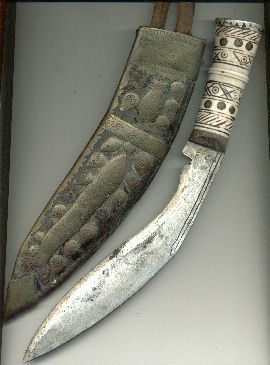 There is another weapon similar to the Kopis and Falcata, called the Kukri, of Indian origin, but is only about half the size of the Kopis or Falcata. This entry was posted in Uncategorized on October 29, 2013 by Captain Belaq. 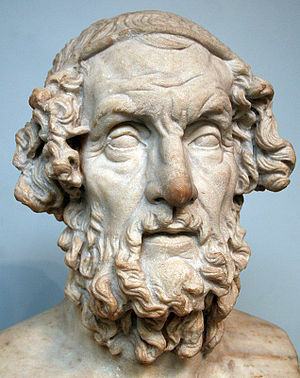 Currently in history, I’m studying the Homeric period, and especially the Epics, the Iliad and the Odyssey. I got a reading assignment, chapter 9 of the Odyssey, the situation with the Cyclopes. I will say it’s pretty gruesome at places, but at the area where they’re blinding the Cyclopes, I found some interesting text. This entry was posted in Uncategorized on October 1, 2013 by Captain Belaq.